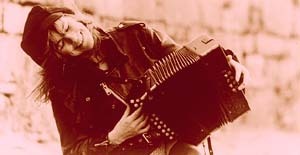 It would seem that just putting an accordion in Sharon Shannon's hands will make her happy. The County Clare lass said she loved to play on tour, loved to play in the studio, and, on her nights off, loves to play at local pubs or at parties. Luckily for the soft-spoken Shannon, others are just as happy when she picks up her instrument. While playing at a "seishun" at a pub in the western Ireland town of Doolin, Shannon was discovered by The Water Boys and was asked to join the band. "I had no plans at all. I never had." Soon, she was off on her own and garnered a devoted following. Her first album went double platinum and she has since performed at the White House and the Royal Palace in Warsaw. She has been cited as having re-created tradtionial Irish music with her virtuosic playing as well as her untraditional song choices. Her repertoire has included everything from Arcadian and Cajun tunes to songs from Portugal. "If I like a melody, I'll have a go at it," she says, adding that she has not given much thought of where she lies on the spectrum of Irish traditional music. Always scouting out new tunes, she says she has tons of cassettes she has yet to listen to back home. Her latest album, "Out The Gap," is evidence of the accordionist's ever-widening reach. Several of the songs were recorded in London with reggae producer Denis Bovell, who suggested, among other things, the additional horns, which add texture to the band's already rich sound. Though "Out The Gap" is an evolution of sorts from Shannon's eponymous first album, but it is still a close relative. Both feature songs that themselves are two or three tunes strung together. On each cut, the centerpiece is Shannon's intricate fingerwork on her button accordion laid over a strong rhythmic foundation. On her slower, melancholic songs, Shannon demonstrates her talent to push out expressive cries from her instrument -- articulating yearning or sadness despite the absence of lyrics. In concert, Shannon and band prove to be another thing altogether. While their albums are impressive and endlessly fascinating in their interplay of melodies and exuberant rhythms, in concert they cut loose and push the song to their limits. Seemingly inexhaustible, Shannon and company keep ratcheting up their breakneck pace as they run through tunes and make it all seem effortless -- as if they were channeling the wind racing across a field.